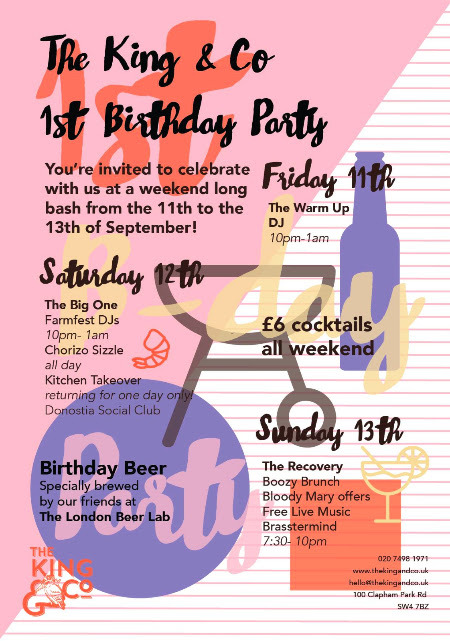 Clapham pub, The King & Co, will be celebrating its first birthday this weekend – and you’re invited! The team will be serving a special birthday beer brewed by The London Beer Lab all weekend, as well as the first taste of the pub’s in-house IPA and a whole menu of £6 cocktails. There will be DJ sessions, free live music from Brasstermind on Sunday evening – party games too! On Saturday 12th September, The King & Co’s first kitchen resident Donostia Social Club will also return for an exclusive one day takeover. Don’t miss their Basque-inspired pintxos and “Chorizo Sizzle”!